I am the clinical director for the Acupuncture Lounge and the Denver Center for Acupuncture and strive to make your experience the best it can be. From a young age I loved health care. I used to follow my father during his rounds at the hospital since I was 7 years old! I really dove into alternative medicine when I was 20 and studied Ethno-botany, at the University of Hawaii, which taught me a wide range of healing modalities from around the world. I received my masters of Science in Oriental medicine from the Southwest Acupuncture College in 2005. During school I had an amazing opportunity to study under my mentor and friend David Scrimgeour. He taught me Japanese Acupuncture, herbal medicine and how to excel with treatments using functional medicine specifically on women. You can find her private practice at http://www.sylviasalcedo.com. Alex will always greet you with a smile. When he is not at the office helping things run smoothly you can find him climbing up a rock wall or in the back country. He is a photographer, videographer and a mountain guide. Sylvia and Alex have two young children. Jenn Puccio graduated on the Dean’s List from Colorado School of Traditional Chinese Medicine (CSTCM) with a Masters of Science degree in Acupuncture (MS.Ac). She also has an undergraduate degree in Cultural Anthropology with focus in Nutrition and Health Education Services. Her focus is working on brain disorders, emotional issues and musculoskeletal pain. In her free time, Jenn enjoys spending time with her son, swimming and reading. Her true focus is reaching out to the community by using her skills to educate and treat others. She is currently in the process of setting up acupuncture programs in homeless shelters and women’s safe houses throughout Denver. healing that comes from self love. mostly to hikes in the beautiful Colorado mountains. Rocio is a NCCAOM certified acupuncturist licensed in CO. She received her Master of Science in Acupuncture from TriState College of Acupuncture in New York City. Rocio was trained in three different styles of Acupuncture and techniques—Traditional Chinese Medicine (TCM), Japanese (KM) Kiiko Matsumoto, and Trigger/Motor point Acupuncture. In addition, she received training in Sports Medicine Acupuncture with Matt Callison—focusing on sports injuries, pain-management, musculo-skeletal disorders and post-surgical rehabilitation. She is also skilled in techniques such as cupping, guasha, moxibustion, electrical stimulation and ear/scalp acupuncture. Rocio believes in the body’s capacity for self-healing and how acupuncture can be used as a tool to help in the healing process. She offers an interdisciplinary and holistic approach and welcomes all bodies and genders. Mattie Tezak is a Licensed Massage Therapist, as well as herbalist, yoga instructor, reflexologist and Reiki practitioner. She graduated from Red Rocks Community College Holistic Health and Reflexology program in 2009 and Denver Integrative Massage School in 2015 after a lifelong journey discovering the benefits of holistic health and bodywork. She specializes in Western Integrative as well as Thai massage, and believes in adding individualized energy work to each client on her table. She is a Colorado native who enjoys playing outside in the garden with her dogs and kids. 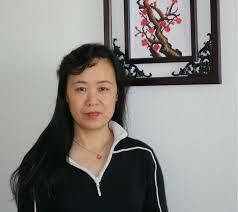 She hopes to continue and deepen her knowledge and experience learning from the guests at the Acupuncture Lounge.